Last week, the NanoBio-RAISE ethics group met in Grenoble where we were hosted by Professor Francois Berger. During our visit, we witnessed five hours of a surgical procedure where electrodes were implanted deep into the brain of a patient with Parkinson's Disease. We were also introduced to the other facilities they host here in Grenoble. It was an enlightening experience in all kinds of ways. We were able to speak with a number of the surgeons during the procedure, which seems to have been a landmark for the medics, as it was the deepest they have gone into the brain. The city is a remarkable place, where scientific research is embedded into its culture. 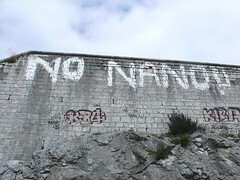 We could not fail to miss the 'No Nano' graffiti. Since I find a lot of my work in the area of public engagement attempts to deal with dissent, I was intrigued by this graffiti and could not read it simply as a problem. By all accounts, the sentiment is not clearly something that is shared by the general population and I always intuitively conclude that such activism is indicative of a healthy community. Of course, there are other concerns in France which have to do with its immediate political future. Nanotech is experimental science and if the right are successful in the next election, there are fears that this could stall the important innovation that is clearly taking place here. One of the biggest values of this trip was to learn more about the 'Nano2Life' network. We had dinner with various people who are involved with this network including Patrick Boisseau. Coincidentally, upon my return I was invited to one of their meetings in Germany, though I am double booked that week. This meeting was such a contrast to the other EU project on enhancement I am involved with (http://www.enhance-project.org), though I suspect I need to get along to the cognitive enhancement section of that project (Anders?). In the case of NanoBi0-RAISE, there are very limited expectations of genetics to deliver enhancement independent of other NBIC technologies.